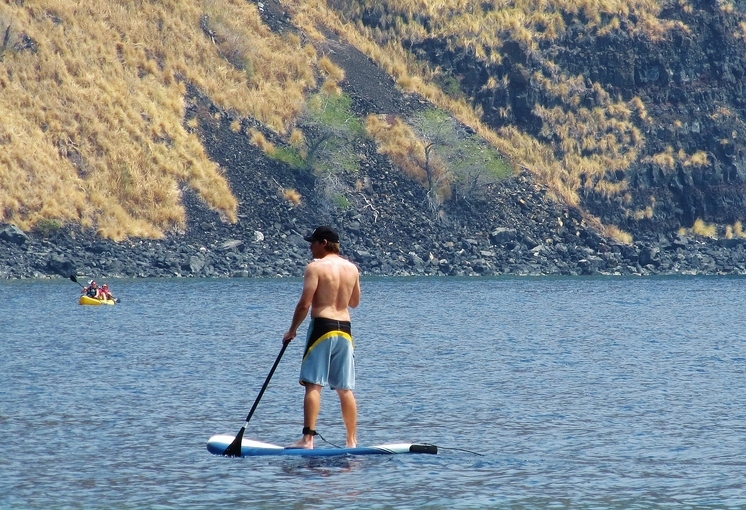 Stand up paddle boarding (SUP) has become increasingly popular around the world, with its roots right here in Hawaii. Known locally as Ku Hoe He'e Nalu, SUP is actually an ancient form of Hawaiian surfing. In the 1960's the Waikiki Beach Boys would use outrigger paddles to paddle their longboards and photograph tourists learning to surf. Unlike traditional surfing, SUP is relatively easy to learn, particularly among women. Something to do with lower center of gravity, I suppose! But men and women alike will appreciate its graceful simplicity and quick learning curve. Within an hour many people become comfortable enough to paddle out on their own. Another great benefit of the sport is that it provides a strong core workout and improves balance. Standing above the water gives a unique perspective on all the sights below the surface. Because of your elevated status on the board, it's easier to spot things that you might miss swimming or kayaking, like a pod of dolphins nearby. Modern surfers have recently discovered its versatility too. Stand up paddle surfing enables surfers to spot waves more easily and to catch more waves in a set. Many of the local Kona beaches with smaller waves offer a great introduction. A typical board is 9-12 feet (3-4 meters) in length. Paddle sizes vary according to the size of the paddler, ideally about 6" longer than the paddler's height. Boards can be rented at many of the local surf shops, activity centers and even at some of the beaches. SUP rentals start at around $25/hour or $67 for a full day. With our warm and calm waters, the west coast of the Big Island is a perfect place to learn this fascinating sport. 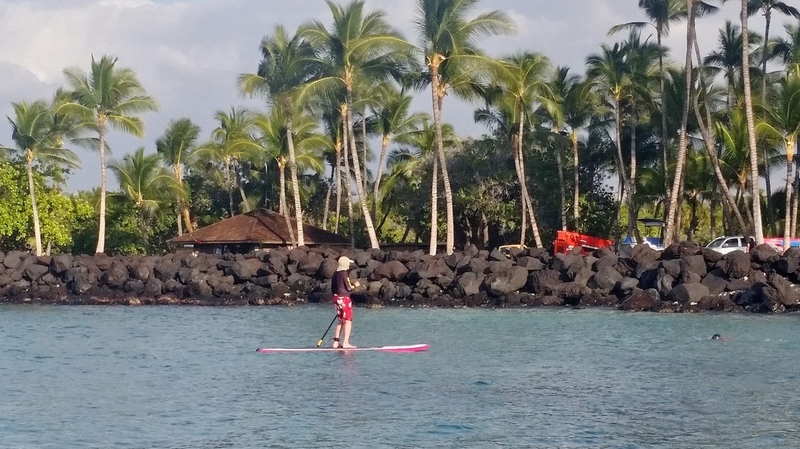 Favorite spots for a smooth SUP experience include Kealakekua Bay, Kailua Bay and Kamakahonu Beach, Kukio Beach, Anaeho'omalu Beach next to the Waikoloa Beach Marriott, the lagoon at the Hilton Waikoloa Village, the beach at the Fairmont Orchid Hawaii, and Mauna Kea Beach. On the east side of the Big Island, your best bet is Hilo Bay. We recommend learning the basics with a stand up paddle boarding lesson before heading out on your own. The calm water in Kahalu'u Bay is a great place to learn. 2-hour lessons are available daily. You will meet your SUP instructor at a nearby surf shop to begin your lesson. Once you've learned the basics of SUP, the real fun begins!